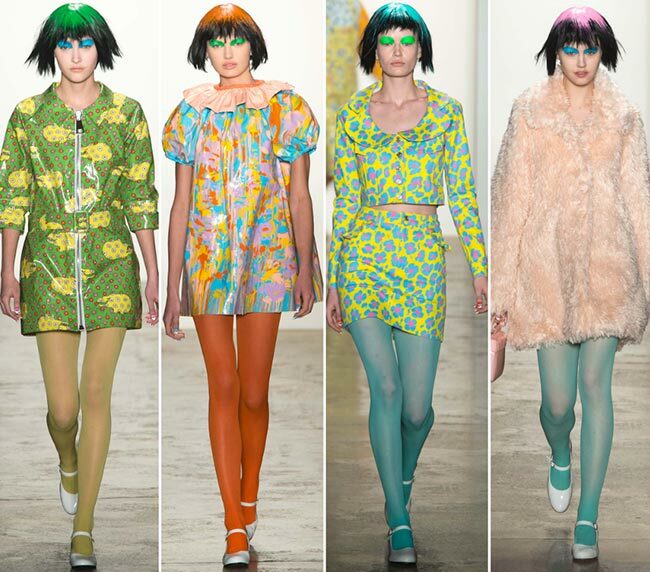 Jeremy Scott is a rather intriguing American fashion designer from Kansas City, Missouri. During the 1990s, he got onto the stage at the Paris Fashion Week, while it was Vogue‘s statement in the year 2000 that really brought the attention onto the rather eccentric artist, admitting that the spring ready to wear show then was “a witty reply to all his detractors, who had accused him in the past of producing outlandish clothing that no one would wear.” We are wondering if the magazine would make such a statement for the Jeremy Scott fall/winter 2015-2016 collection that is probably the most outlandishly colorful line-up we have seen on the New York Fashion Week runway yet this year. While most designers have stuck to darker coloring and toned down hues, Scott’s models seem to have taken on a paint store and combined it with some clowns and somehow managed to create a rather interesting combination of fun and out-of-this-world. 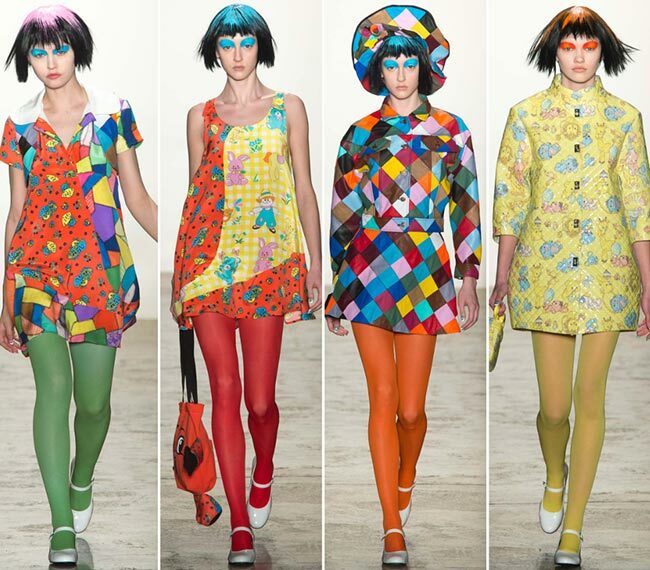 Literally, it appears as if the clowns have been let loose onto the catwalk and there is nothing we can do about it. 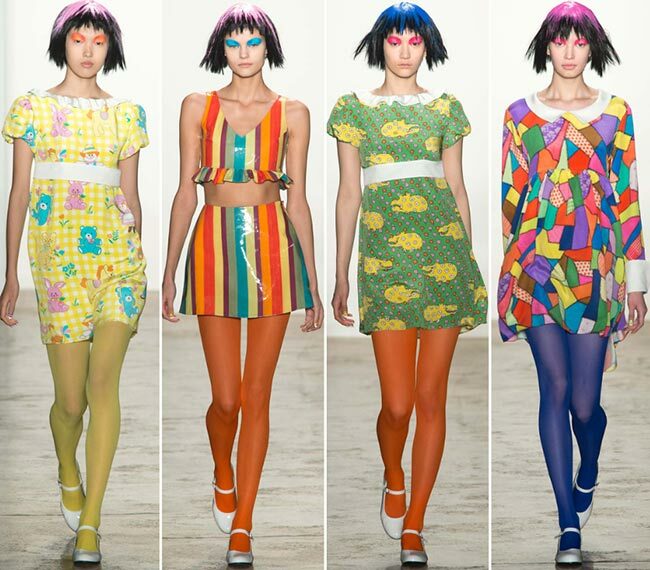 Jeremy Scott loves doing something different, something no other designer dares to try. His style is unconventional to say the least, and has the ability to really turn heads wherever one sees a piece from his eponymous label’s collections. We all fell in love with the retro-futuristic stewardess dress Brittany Spears had donned in her video “Toxic’ and were enchanted by the denim worn by Rihanna in her “We Found Love’ music video. We were also quite amused to see the Moschino unisex scent by Jeremy Scott, called Moschino Toy and in the shape of a teddy bear. Definitely worth the buy, if nothing than for the amusing packaging of the product. His first Moschino collection was presented in the fall of 2014 and we have been looking forward to seeing more, much more! 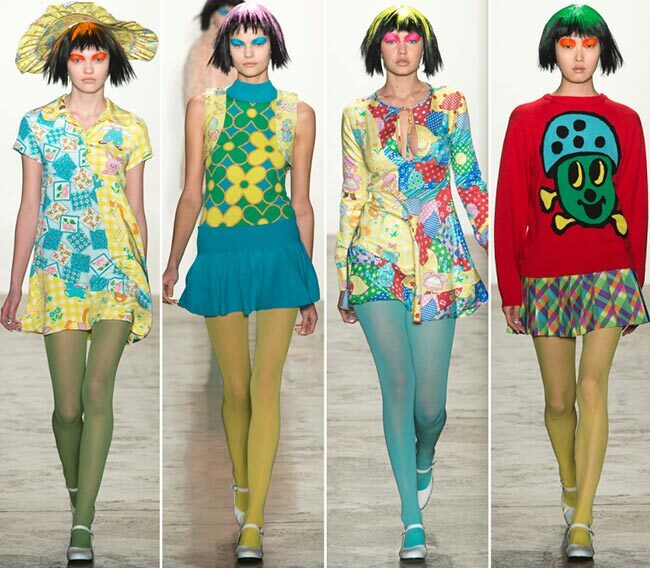 Punk is a good look for Jeremy Scott and his rebellious nature shows loud and clear in every collection he releases. The show started with a pretty little red, blue and yellow floral printed baby doll dress, complete with the white frills along the round neckline and the short sleeves, as well as blue stockings and white little lady buckled dancing shoes. The stockings across the collection range from the light blues to the greens and the reds, the yellows and the orange, the indigo and the moss. All the shoes appear to be the same, giving the feet a daity doll look while the heads are a whole different story. 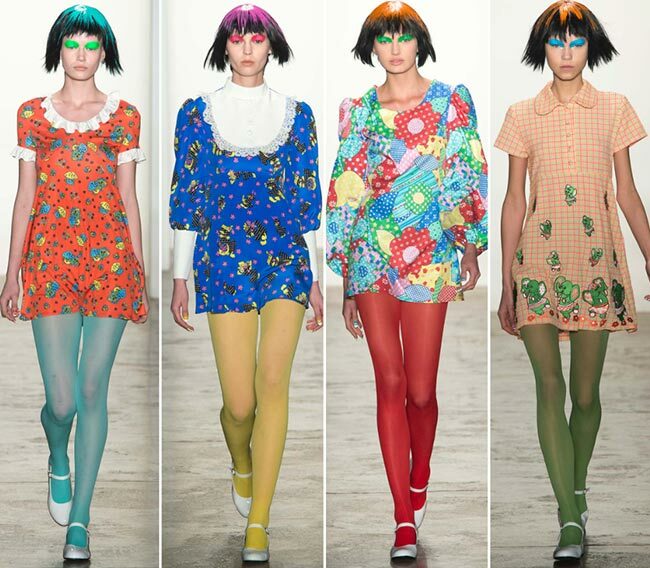 If you thought your childhood dolls had too much makeup on, then you should check out these Jeremy Scott models, with their extremely short cropped hair and the burst of color at the very top, matching their stocking colors for the most part. You have crazy reds, greens, blues and purples adorning the eyelids with their extreme boldness and you have the most colorful array of baby doll dresses seen yet. Let’s not forget the pyjama looks and those really awkward bright neon hued sweaters with the strange cartoonish characters emblazoned over the chest. An oversized shiny plastic looking Minnie Mouse dress in pink with polka dots ends the 45-piece long collection, though we are still wondering if anyone would even dare to wear any of these pieces. Time will only tell, but they might not end up in our closets this time around.